These little pattern pieces are small, but incredibly useful! What is a quarter-scale pattern? 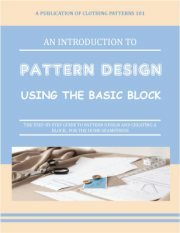 It's a tiny version of a block pattern, which you will use to practice the various pattern and design techniques outlined on this site. Using a full-scale block pattern to experiment and learn how to manipulate darts, slash-and-spread your pattern, etc., is very cumbersome. Using the smaller scale patterns allows you to get comfortable with the steps you'll need to do to get the style you want. You do NOT then increase that pattern to full scale. Many people have asked about that, but increasing the size of the practice pattern is useless. It's highly unlikely that the size will be correct, and it defeats the purpose of creating a full-scale block to use as the basis of your personal fashion patterns. No, after working out the steps you'll need to create your style, you will then repeat those steps using your FULL-SCALE block (which DOES fit you!) . 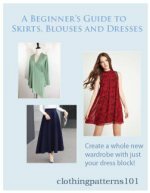 You'll have a pattern that fits and reflects your style! Print your quarter scale patterns here. Glue the sheet of pattern pieces to card-stock, then cut them out. You can use them over and over again!